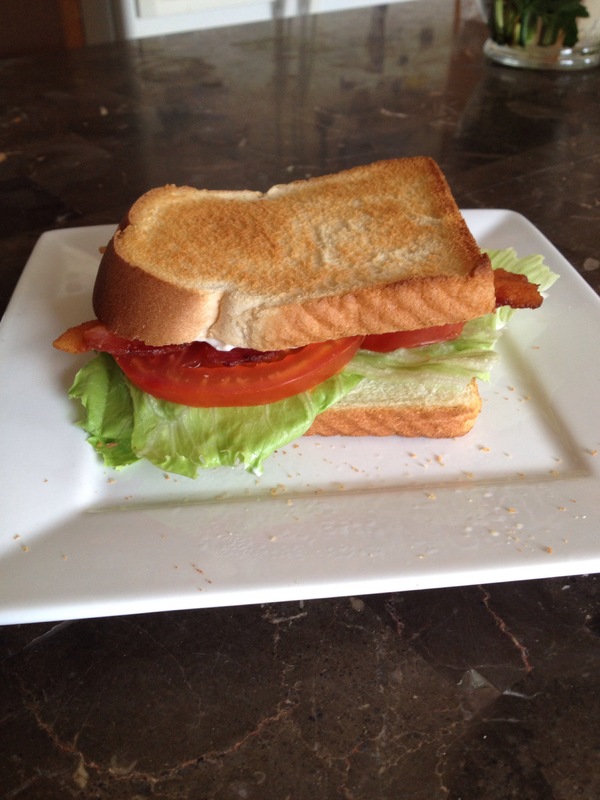 This just isn’t any ol’ BLT it’s perfect. I would like to outline for everyone what, in my eyes, makes the perfect BLT. White bread – normal white bread, no Texas toast or other fat bread. Plain ol’ white. A little bit of mayo. Don’t glob it on, just the right amount to make the toast not so dry. Tomato and lettuce – no special things needed just don’t over or under do it. Two slices of tomato is fine. It needs to cover the sandwich. Also just a couple pieces of lettuce, I don’t need a salad on my sammy. Bacon- very important : it MUST BE CRISPY. Don’t serve me some wiggly bacon that I am going to have to chew through like a gummy worm. I like it to snap when I bite into if. Also 3-4 pieces is plenty. Again, don’t under or over do it. Every time I order this at a restaurant my husband laughs because I specify: toasted on white with crispy bacon and light mayo. However every time I don’t I get something on non-toasted bread with chewy bacon. Also I would like to point out that this delicacy is not just for lunch around here. No sir, this baby is my go to for breakfast. When Brian moved down here I realized how important breakfast was to him. Now we go out to breakfast every Saturday with friends. Now, don’t get me wrong, I am down with French toast and pancakes. I just don’t want them on the reg. Typically for breakfast just bring me a BLT. But make sure it is toasted on white with crispy bacon and light mayo.